DETROIT, Feb. 11, 2019 /PRNewswire/ -- While it's not surprising that many consumers look at ratings and reviews before making purchases, it's interesting that they tend to skip this process on larger decisions, like where they keep their money. A new online survey conducted by The Harris Poll on behalf of Ally shows that nearly half of American adults (49 percent) say online reviews are extremely or very important in helping them decide which products and services to buy, while only 23 percent of adults have used online reviews when choosing a bank or other financial services provider in the past year. This lack of research and complacency with banks means consumers are often putting up with low quality or downright poor service they would never tolerate in other areas of their life. Ally's new campaign uses this insight to illustrate in a humorous way what can go awry when you choose the wrong service. "People seek advice online for a number of daily purchases but accept the status quo when it comes to banking," said Diane Morais, president of consumer and commercial banking products at Ally Bank. "They can and should expect more from their bank just like they do for other purchases. At Ally it's our mission to do right by our customers and their money which has earned us praise from many customers and the media." 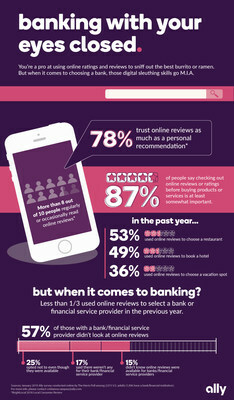 Further results from the Ally survey show that among those with a bank or financial service provider, only three in ten (31 percent) looked at the institution's online reviews when choosing their bank and 51 percent of Americans with a bank or financial service provider have never read online reviews of their bank. 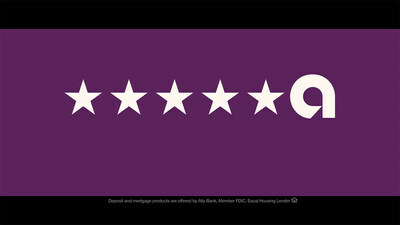 Many banks aren't highly rated and customers often express frustration with their current bank. E-Score® Brand research† shows that only 19 percent of customers love their "big bank" while 75 percent of consumers have never even considered switching their current account. Ally Bank is at the top of multiple lists that rate banks including being selected as the Best Online Bank by MONEY® Magazine, GoBankingRates.com and Bankrate.com, and as the Best Savings Account with Consistently Good Rates by MyBankTracker.com. The bank also ranked first in the Online Banking category of Newsweek's inaugural list of Best Customer Service. Ally's new creative campaign aims to show the importance of ratings, with exaggerated scenes of what can happen if you don't read the reviews before purchasing a product or service. The "Ratings" campaign debuts with a 60-second "The Name is the Idea" anthem spot and three 30-second spots, "Sushi," "Dentist," and "Mechanic." "The campaign aims to shake people out of their complacency to realize that a better bank is out there – one with better rates, better customer service and an overall better experience," said Andrea Brimmer, chief marketing and public relations officer at Ally. "You'll see our spots on television, but also in context where consumers are looking at ratings for things like online purchases and restaurants." The campaign will be seen in major primetime and sports programing as well as online advertising and in social media beginning on February 11. The campaign will run throughout 2019. 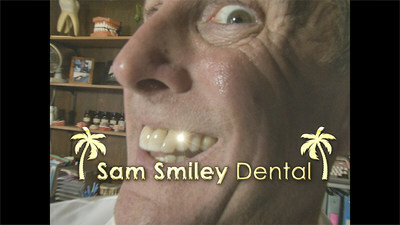 In addition to the television advertising, Ally will run "Mediocre Ads for Mediocre Things" in online pre-roll, including what appear to be ads for a local dentist and mechanic. 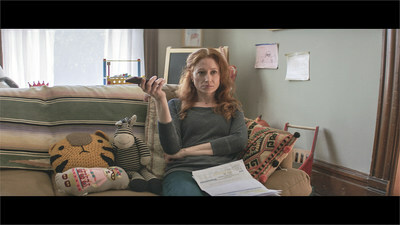 These attention-grabbing ads will be followed by a spot from Ally to help consumers make the connection to the importance of checking the ratings of their banks. This survey was conducted online within the United States by The Harris Poll on behalf of Ally Bank from January 2 - 4, 2019 among 2,015 U.S. adults ages 18 and older (1,906 with a bank or financial services provider). This online survey is not based on a probability sample and therefore no estimate of theoretical sampling error can be calculated. For complete survey methodology, including weighting variables and subgroup sample sizes, please contact cristianna.vazquez@ally.com.